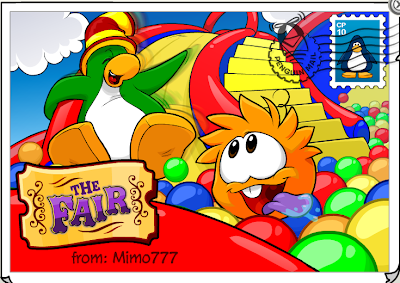 Club Penguin Cheats by Mimo777 Club Penguin Cheats by Mimo777: Club Penguin Fair Stamps & Postcard! I better get busy earning more stamps! Let me know what you are enjoying most at The Fair, k? what game do you get the 50 target one? I have all party stamps! I havnt been on Club Penguin in a while, I need to get working on the free items! dear mimmo,i found a popcorn pin,go to the redeem tickets on the forest,then click on pin,it dosnt cost anything,you can also get the fair beacon background for free. i got all of the stamps!!! :)Go Me Go ME!! i got the last stamp by getting most of the puffles fed in the puffle feeding game. hope this helps you guys =D. p.s. i met ALL of the famous penguins *including sensei* but i met them before the stamps were out... and some of the penguins only come out every few years. like aunt arctic. Mimo! RH has a brand new background! there is a new home page on club penguin. the stamp looks cool and phun! Wow this fair is GREAT!! It has to be the best i've been to so far, If it gets better every year I can't imagine what next year will be like!! Mimo, How do we meet you? I cant get the first one to work.... HELP! YAY! Found RH! He has a new background! I love puffle paddle! I got 1500tickets and bought everything!! I met rockhopper! He has a NEW background! He was funny too. We were at the cove and he is like "YARR, WHY DID YE STEAL THE LOGS?" lol! P.S. I will try to make a vid cuz I took 7 snap shots! Just met Rockhopper. Hes got an amazing new background! Hi everybody! Dedgie02 is back. It's been tough and i've had loads of stuff goin on so i haven't been on for months. Sorry guys. Aaaaaaaaah! I've moved down the mod list! Better start modding then! But so that you guys know i can't mod as much as i did because homework is really tight now! Yeah that happened to me! I've met all of them too. But today i met rockhopper and I got the stamp! Yay! Oh and so you know mimo Rockhopper has a new background...again! Did you include EVERY famous penguin? Becuase the only one thats possible to get of a stamp so far is rockhopper. Sorry! If you got all the others though then you must be totally ace! I probably missed that because I haven't been around for a while. Do you need a drummer? hey Mimo, my favourite thing at the fair is the memory game because sometimes if you get them all right you get 80 tickets! Hey and Mimo i think you should start a FAIRly awesome party while the fair is on and every penguin needs to wear all there awesome hats etc. From this year's fair and penguins who was at last year's fair! it would be awesome for everyone to come and we can get stamps and stuff, anyways the fair is awesome! bye. rockhopper has new background this time! Same here! It is so annoying because u have done that stuff before! usually in your inventory, it sorts your items by time they came out. clown stuff is old item. It puts your clown stuff at the end of each section (head, feet, body) and that means its a new item but they arent so therefore the clown stuff at this fair are replicas! if u take a puffle to balloon pop, your puffle in balloon pop will be that color! Otherwise it will just be blue! It's awesome! Go Club Penguin! You play any of the games like Feed-A-Puffle or Puffle Paddle. Just play for a while then you should get it. I know no one will smile for me too! The most I've gotten is 5 people but after a while they all give up! Heres a little glitch. If you wear the Balloon Flower Hat, it covers the bottom of your name! Not really a glitch but i dont know what to call it. YUP!! ROCKHOPPER IS HERE!!! -indiana742 P.S LETS earn a stamp. I thought the target champion stamp was from the squirt the puffle game in the special room off the fort????? to get the target stamp, hit 50 puffles on the puffle feeder game. I got it. His new background is awesome! Well done for meeting him! Just keep tryin, people will smile sometime! Cool! I didn't notice that! It ALMOST makes me want my membership back.. nah. Mimo, Can I Join CPG? Anonymous you get the 50 target pin on the game were you feed all the puffles. Me too. They should release some new fair games next year. And a pizza mixer! You need to play the Feed A Puffle game. It's located at the Cove. Really? Cause Club Penguin said the 21st it releases. Hmm. That game your looking for is Feed A Puffle. It's down at the Cove. Happy feeding! Cool. Me too. I hope they release lots of them cause those are fun to get. Get working on the Stamps too! Hmm, must of been one of Club Penguin's glitches. It's probably fixed though. Cool. Keep working to get those last couple! Next year it should have confetti raining from the sky! You gotta be at one of his partys. Every once and a while he has a Club Penguin party. THE ORANGE PUFFLE IS STILL IN BOX DIMENSION! Yeah I know! It's weird huh? I think it's stuck in there to endlessley float around on a box...RANDOM! (sorry about caps). Only put (CPG MOD) when you are modding. Thanks! It's from the feed a puffle stand in the cove. Good Luck earning that stamp! well you cant get the pin!!!! hello, i am having issues getting the "snack shack" stamp. I have stood by many different food stands and used numerous emotes, but its still not working. any hints? thank you! love this blog mimo!! Unfortunately, you probably didn't help because you gave them the wrong location. The correct location of the Feed-O-Puffle is at the dock.